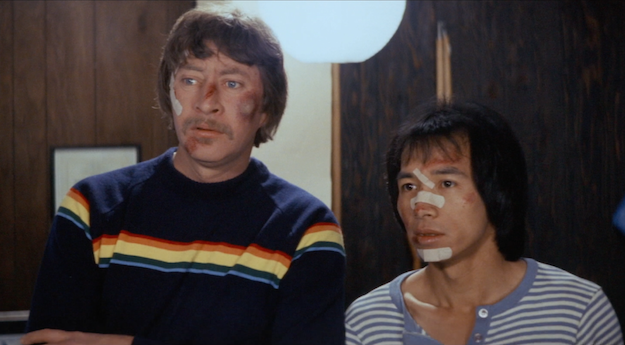 As a fan of genre and cult cinema, the story behind this new Blu-ray release of the martial arts comedy Ninja Busters warms my heart. Completed in 1984, the film was never officially released because the distributing studio went under. All prints were presumed destroyed. Recently, a single 35mm print was discovered by the genre-focused curators at Exhumed Films, who screened it at their eX-Fest film festival. The audience loved it so much that Ninja Busters was given a 4K digital scan, and is now available to the general public for the first time ever, thanks to the newly minted Garagehouse Pictures home video label. That story is so cool that I just wish I enjoyed the movie more. Boasting an absurd premise, stiff line readings, and an abundance of atypical martial arts choreography, this flick initially seems like another surefire cult masterpiece in the mold of Miami Connection. Well, not quite. Both flicks are disarmingly earnest. They are both sprinkled with WTF? moments tailor-made for folks looking for something "so bad it's good." But Miami Connection has the benefit of being overstuffed with incident. Ninja Busters, on the other hand, has many many slow, dry stretches on the way to its haywire climax, an enjoyably chaotic battle royale between ninjas, martial art students, teamsters, and bikers. Our main characters, Bernie (Eric Lee) and Chic (Sid Campbell), were seemingly named by parents who saw too many Abbott and Costello movies. The film tries mightily to make these two into a comic team of that ilk, but their timing is not quite up to snuff. A running gag about Bernie and Chic pretending to be Bruce Lee's student and teacher is repeated four or five times and lands with a dull thud each time. Bernie and Chic's transformation into busters of ninjas begins when they are fired from a warehouse job after they try to open one of their gangster boss's crates and see the contraband inside. Almost immediately afterward, they grab a bite to eat and end up in a fight with a couple of bikers, who both end up kicking our ostensible heroes in the balls. Soon, this goofy duo make their way to a karate studio -- not because they want to learn how to defend themselves, but because they want to pick up chicks. Time passes, and the pair gets tired of the scornful looks coming from both their female classmates and their new sensei, so they figure, eh, why not try to actually get good at martial arts? Cue forty minutes of only mildly convincing karate training. The plot's prolonged training detour eventually ends -- though not before Bernie and a young biker spend three years (!!) attaining the skill level of the black belt so they can fight each other -- and that gangster boss re-enters the picture. He tries to sell some weapons to some black revolutionaries, and when they stiff him, he unleashes an army of ninjas upon them. Bernie and Chic happen to witness these doings from nearby and end up in a skirmish with some of these ninjas. They manage to escape but find themselves marked for death. Every place they go -- their karate studio, a salsa dance club, an aerobics class -- is soon besieged by hordes of ninjas, eventually culminating in that aforementioned battle royale. Ninjas are supposed to be excellent, stealthy fighters, but fortunately for our heroes, this particular batch is mostly pretty inept at fighting, bad at hiding, and easily conquered. Ninja Busters is not a cracked masterpiece, but I'm still glad it was rediscovered. There are scattered memorable lines, some endearing performances (especially Nancy Lee as Bernie's love interest), and some well-staged action. (Director Paul Kyriazi oddly seems more at ease staging massive multi-person setpieces than some of the clunkier one-on-one fights.) Your mileage may vary when it comes to exploitation movies with an outsider-art vibe and the major action scenes rear-loaded, but I figure if you've haven't already had your fill of goofy ninja movies, then you should certainly give this one a shot. The region-free Blu-ray is packaged with a card that features the film's new poster illustration on one side and liner notes from Exhumed Films' Dan Fraga on the other. The AVC-encoded 1080p 2.40:1 transfer, sourced from a 4K scan, is very strong. The image is not without its hiccups, but these all seem to be derived from the original film, which was a 35mm answer print. Hence there are certain inconsistencies in color temperature and image density, but nothing that grindhouse cinema fans haven't experienced before. Setting those flaws aside, the transfer boasts excellent clarity and stability, and -- shockingly -- little in the way of dirt and damage. The LPCM mono audio sounds damage-free, but it's less impressive than the picture because of its general boxiness and occasional muffled sections. No subtitles. Intro by director Paul Kyriazi (HD, 2:30) - The director walks through a Ninja Village in Japan and talks a little about the history of the flick and its recent re-discovery. He also "runs into" Fumiko Takahashi, who plays a villain in the film. Audio commentary by director Paul Kyriazi - Plenty of ground is covered in the wide-ranging commentary, but too often director Kyriazi is lost in some anecdote that is not completely related to what is going on onscreen at the moment. It's a bit too rambly to be consistently compelling. The Tournament (48:47) - This is director Paul Kyriazi's surprisingly assured first attempt at a feature film. Shot in black-and-white 'Scope, the film plays out somewhat like Enter the Dragon if it had been directed by Akira Kurosawa. A number of different factions meet in the woods on the way to a fencing tournament and end up battling it out, making their journey through the forest the actual "tournament." The acting is hit-and-miss, and it's hard to keep track of the dozen or so characters, but overall, it's a fun time. Unfortunately, the only surviving copy (barring another discovery in some storage locker somewhere) is a muddy VHS tape, so the image quality is far below reference. Fan Testimonials (HD, 1:52) - A brief montage of excited fans giving their reactions to Ninja Busters after a festival screening at the Alamo Drafthouse in Yonkers, NY. I'm more excited by the idea of Garagehouse Pictures uncovering and releasing more forgotten oddities like Ninja Busters in the future than I am thrilled by the actual film itself. Don't get me wrong, the flick has its memorable moments, but it didn't totally connect with me. I figure if you loved Miami Connection, then you certainly should take a look at Ninja Busters. For this special breed of genre fan, the flick definitely comes Recommended.